Village Montessori School understands the importance of extra-curricular art and physical education. It’s why we offer a wide selection of extra-curricular activities to the children of Roswell, GA. Whether they are in our toddler program, primary program, or even middle school program, we offer differing levels to continue to challenge your child physically and in the arts. ​Students will enjoy a variety of art projects and media as they bring their vision to life during class. Exposure to a variety of artistic styles and creative motifs allow children to explore artistic expression in fun and familiar atmosphere. Projects will be geared toward students’ area of interest. Works will include exposure to 2D and 3D creations which will help facilitate the development of their fine and gross motor skills. ​This imaginative dance class is 45 minutes in length and offers both tap and ballet. Classes are taught once a week with whimsical tunes and props such as tiaras, pony sticks, glitter, magic wands, and more! Your child will learn basic tap and ballet steps, proper form and terms. Ballet provides the basis for all dance technique. Children learn skills in listening, coordination, poise and grace. Improved posture, balance, coordination, focus, and body awareness are all benefits to this class. Our experienced instructor is a VMS parent and a valuable parent resource. ​Our sports curriculum is a uniquely designed extra-curricular program introducing a variety of sports and recreational games for children. 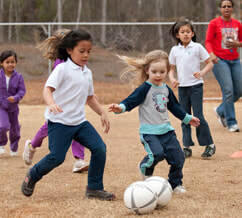 Each week a one-hour session by the staff offers basic skills and games for your children. The program will emphasize character forming lessons such as fair team play, individual concentration and cooperation, and encouragement. The benefits of enrolling your child in our sports program are increased psycho-motor development through fun fitness activities, character formation (lessons in honesty, sharing, helping, respect, self-control, attitude), and development of active lifestyle habits. ​The primary extra-curricular program focuses on developing listening and speaking skills. Children learn Spanish with lesson plans that include topics familiar to the child. Spanish words and phrases are taught using simple rhythms. Themes include greetings, colors, numbers, food and clothing. These topics include an oral or visual activity to help the child teach and reinforce knowledge of the new language they are learning. Topics include Spanish pronunciation, basic concepts, vocabulary and culture. Some games and songs are also incorporated so that the child can learn Spanish in a fun way. Early exposure to other languages creates a facility for understanding and speaking, as well as greater ease in later study. It also creates an early awareness of different cultures.